Most people are aware of the destruction of Pompeii that occurred on August 24, 79 A.D. The ruins of Pompeii are world famous. Each year thousands of visitors flock to Italy to view the archeological wonder. They are one of the most visited attractions in the country. Relatively few people realize that on the day Mount Vesuvius erupted it destroyed another city, Herculaneum. Through the ages, the ruins of this once prosperous city have been remarkably well preserved and they are well worth viewing. On the day Vesuvius erupted, Herculaneum was upwind from the volcano. Pompeii was downwind and was quickly buried under a covering of ash. Herculaneum was destroyed more than twelve hours later when the blast cloud collapsed, spouting forth a barrage of searing ash, rock, pumice and volcanic gas, which sped from the mountaintop at 60 miles per hour. The debris that fell on Herculaneum reached temperatures in excess of 760 degrees Fahrenheit and reached the city within five minutes. Everything in its path was instantly destroyed and the entire city was buried under 65 feet of ash and slag within hours. Though the ruins of Pompeii are more popular, those of Herculaneum are much better preserved because of the barrage that buried it. The wood that had been used to construct the city was instantly carbonized. The ruins of Herculaneum were unearthed in the early 18th century by workmen who were digging a foundation for a well. Near the end of the century the relevance of the find became known and excavation of a serious nature began. These early efforts to completely excavate the city were compromised when the tunnels and portables collapsed. Today, much of the ancient city is still buried beneath tons of rubble. Before the eruption of Mount Vesuvius, Herculaneum was a tranquil, up-scale Roman town. Its narrow streets were lined with businesses and homes. No carts or wagons were allowed on the main street, where people went about their business in a leisurely way. Most of the sidewalks were covered with awnings to protect patrons from inclement weather. Aqueducts brought water from the mountain to be filtered and stored in the city’s public water tower, from which it was distributed through an elaborate plumbing system to city homes, businesses, baths and fountains. All prosperous Roman cities of the time had complex water systems that supplied precious water to the community. Luxurious public bath houses were used for socializing and demanded huge quantities of water daily in order to operate. These bath houses were open to everyone and were visited once a day by the people of Herculaneum. Bath houses of ancient Rome represented the wealth of the city. Herculaneum’s bath houses were elaborate. 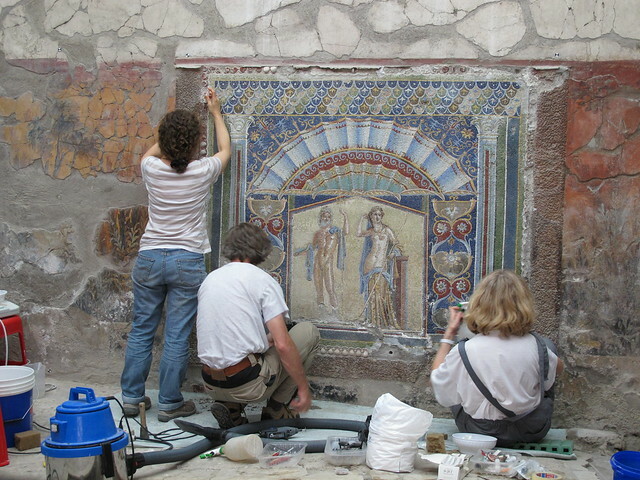 Mosaics and carved and painted frescoes decorated the walls. Marble fountains and sinks, exquisite tile floors and beautifully carved statues added to the grandeur of these influential places. A visit to the public bath house consisted of a workout for the men at the gym next door, before they entered the actual bath house. All visitors to the bath house were lathered with pumice and olive oil, scraped with a stirgil, and then sent on to the warm room (tepidarium.) From there, the person moved on to the hot room (caldarium) and finally to the cold room (frigidarium.) Here, they were toweled dry to complete their visit. The Romans who lived in Herculaneum gathered at a huge arena to socialize and watch sporting events. The arena that was unearthed in the city is as large as a city block. The Palestra (main hall) housed a magnificent statue of Hercules, who the city was named for. To visit the ruins of Herculaneum, catch a bus in Naples, or the Circumvesuvia train at the Ercolano station. Be sure to take along a guide book to make the most of your visit. Wear comfortable shoes and take along lots of water if you’re visiting in the summer. There’s virtually no shade and the days can become very warm. Once you arrive in Herculaneum, you will be in awe of the spectacular ancient ruins. As your eyes take in the sights, your mind will transport you back in time to the ancient city before it was destroyed. It’s an experience of a life time that you won’t want to miss. It’s not everyday we get to see buried treasure.